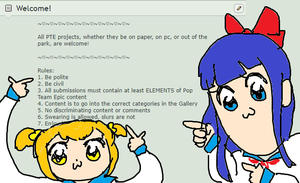 By fans and for fans of bkub's Pop Team Epic/Poptepipic! All PTE projects, whether they be on paper, on pc, or out of the park, are welcome! Willing Moderators encouraged to Apply! man what happened to the other PTE group? did it got reported? Oh wow, I'm very lucky! Why I wanted to get in was because I got banned from the other community, but as explained, I can change my ways in any form. One way would be the explanatory method. How this works: I could explain what good things I did. just follow the rules and stay in your lane, and you should be good to go!